General Hospital (GH) spoilers tease that the ABC soap will bust out some bombshells for May sweeps. Things will definitely heat up as the rest of this month plays out. 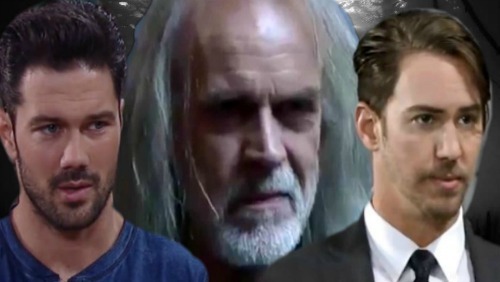 The Heinrik drama is building to some shockers, so GH fans won’t want to miss what’s next. Peter (Wes Ramsey) and Valentin’s (James Patrick Stuart) alliance is slowly crumbling. The walls are closing in on both of them and that’s leading to major mistakes. Between Peter’s feelings for Maxie (Kirsten Storms) and Valentin’s longtime Anna (Finola Hughes) obsession, they’ve set themselves up for trouble. Valentin and Peter will continue to make bad decisions thanks to what’s in their hearts. Of course, Valentin will be desperate to preserve his marriage to Nina (Michelle Stafford) as well. There’s no denying that he loves her. Still, Valentin also cares about Anna deep down and that could lead to more risks. General Hospital spoilers say serious danger’s brewing and it could all kick off at the Nurses Ball. Several GH characters have been concerned about the threat Heinrik poses. Those who only know him as Peter have been fearful, too. This guy just can’t be trusted. Nina was touched by the info in Nathan’s (Ryan Paevey) file, so she’s softening toward Peter a bit. Nevertheless, there’s probably part of Nina that will continue to worry about Maxie getting mixed up with him. Curtis (Donnell Turner) and Sam (Kelly Monaco) also suspect there could be more than meets the eye. Once the Heinrik and Peter plots collide, there’ll be plenty of people out to get Peter. Jason (Steve Burton) will obviously be one of the first in line! However, we have to wonder if Maxie’s the helpless little thing Nina thinks she is. Maxie was absolutely devastated by Nathan’s death and she’s made it clear that she loathes Heinrik. Grief and anger are a dangerous combo. Peter’s also been lying to Maxie for months, so that’ll be another blow to stir up trouble. Everyone would expect someone like Jason or Valentin to attempt Peter’s murder. It wouldn’t be surprising if Peter wound up at GH after a faceoff with one of them. Could General Hospital go for a twist instead? Should Maxie be the one to unleash her deadly wrath? General Hospital spoilers say Maxie could be filled with enough rage to make it happen. She deserves the chance to seek revenge! We’ll give you updates as other GH news comes in. Stay tuned to the ABC soap and don’t forget to check CDL often for the latest General Hospital spoilers, updates and news.